Departing Bridge Bay slightly before sunrise, I started scanning Hayden Valley. I made it all the way to Alum Creek with plenty of bison and elk. Back by the utility poles, there was a pretty large grizzly wandering north. The bear tucked into a depression, so I backtracked to the hilltop across from Grizzly Overlook to get a higher view. I had my scope out just in time for the bear to make it to the treeline. What was interesting is that there was a smaller animal following it just a step or two behind. Cub(s)? Nope, a coyote. The bear didn’t seem to mind though…it was strange. After the bear was out of sight, there was some audible howling / yapping. Seem to be coyote speak. Soon after the coyote reappeared in the meadow, and then a second. Seems they were locating each other. They spent some time mousing in the field and hunting together. There was another gentleman up there telling everyone that there were two wolves. I didn’t want to burst his bubble so didn’t say anything…hate to be that guy. Plus I suppose I could be wrong. It could have been the Wapiti females, but I doubt it – it didn’t look like them (snout size, running posture, etc). Plus, why would they leave 755m with the kids so they could mouse and otherwise goof off in a field? Especially when they were hauling meat from a kill the night before; seems returning to that kill site would be a better use of their time. What would you do in those situations? Back to the overlook, I was scanning when someone pulled up mentioning a wolf sighting on the radio. Turns out someone closer to Alum Creek spotted 755 and a female from their vantage point. Eventually I was able to spot him, lying motionless way out by the lollipop tree – hard to find when they are not moving. Eventually we located the female, but it was mostly lounging around until they left to the north. Moving on, stopped by the Canyon osprey nest. Chicks are hatched, although I never got a good look to see how many. In hindsight, I should have pointed my scope at it and been more patient. Oh well. After breakfast at the Fountain Grill, it was time for a hike. Washburn was on the wish list for the day. I got there at about 10:30 and had to park at the neighboring turnout. The trail was mostly clear of snow – just a couple stretches of complete snow coverage. The top was windy as usual but not that cold. 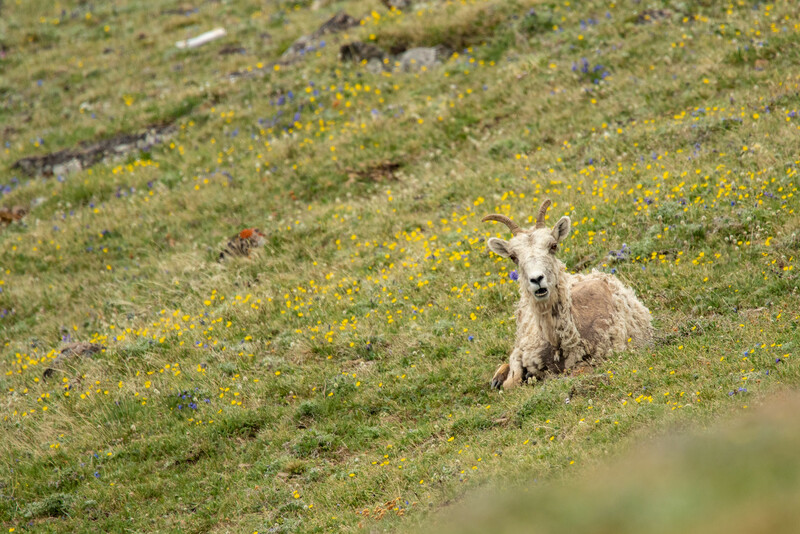 There were only a few bighorn sheep around the corner, from where both Washburn trails merge. There were plenty more sheep on the cliff-side, spotted almost at the bottom of the trail, way high up. 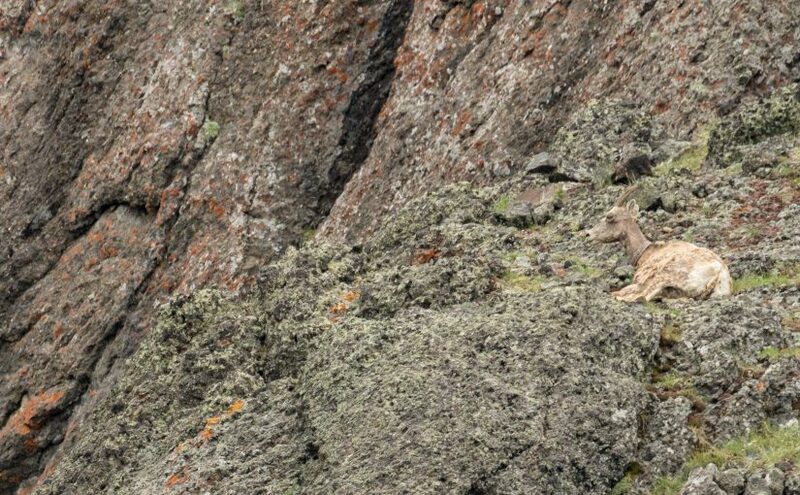 I was able to spot a mother and baby way high up on a cliff. The baby was surprisingly agile on the cliffs and had no trouble galloping around. There was even a nursing session. Skies were overcast, and rain started a couple times towards the bottom with quite a gust of wind. Back in Hayden Valley, the rain became more steady. What happened to only the occasional afternoon thunderstorm? Since the rain wasn’t going to let up, I took a drive all the way north to Blacktail Plateau Dr, which was open. Along the way, there was a very wet coyote, pronghorn, and hawk. Another two-dog day. That fox almost always eludes me.